When Jon is away I still like to cook a good meal for dinner. Sure, sometimes my daughter and I go out to dinner, usually to her favorite spot for a bite - Wegman's. She gets a kick out of getting her food, paying, and then getting on the elevator to go eat upstairs, and once up there she gathers our napkins, forks, and condiments :). But for the most part I'll cook a balanced meal at home that I can get on the table quickly. In preparation for our girls' night the other night I picked up some sweet Italian turkey sausage. I love breakfast turkey sausage, but have never used turkey sausage for dinner since Jon only eats pork sausage, so a girls' night would be the perfect time to try it. I also love pork sausage, but was pleasantly surprised that the turkey sausage was just as good once I added some seasoning (I prefer hot sausage so some red pepper flakes did the trick). And at 69% less fat (as per the package), he doesn't know what he's missing. I'll have to sneak it into a dinner one of these days... sssh, don't tell him! 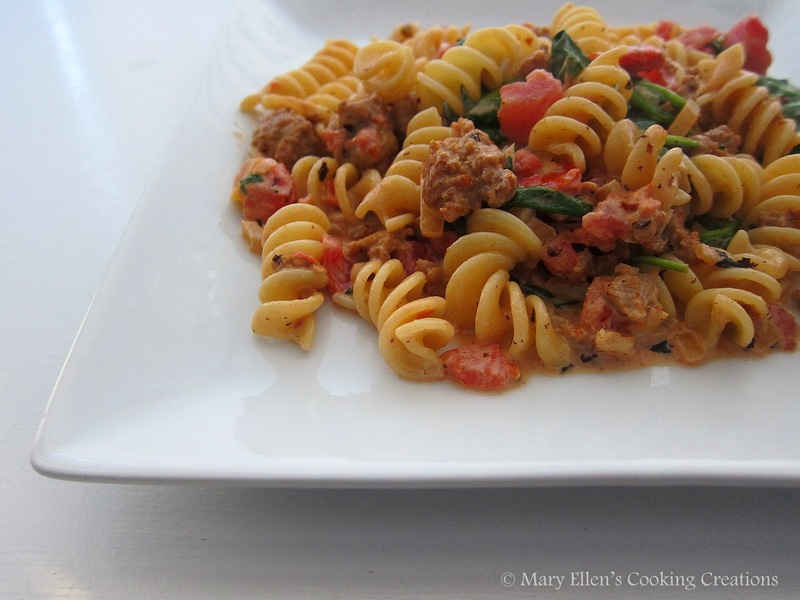 For our turkey sausage dinner inspiration I turned to a cooking forum and asked for recipes. My friend Sarah responded with a link to a recipe in her blog for Bow Ties with Sausage, Tomatoes and Cream. Upon reading the recipe I knew it would be quick, easy, and delicious. I made a few changes based on things I had on hand and personal preference. I also cut the recipe in half since it was only the 2 of us. I had this one on the table in 20 minutes! The prep is quick, you start cooking the sausage while the pasta water is coming to a boil, and then you cook the sausage while the tomatoes and cream are simmering. By the time the pasta is done, the sauce and sausage are ready - this is the perfect weeknight meal. In the meantime, heat olive oil over high heat in a large sauté pan. Crumble the sausage into the pan and cook until browned, about 10 minutes. At this point the water should be ready - salt the water (1/2 tsp or so) and cook your pasta. Drain and set aside. Once the sausage is cooked, add the red pepper flakes, onions and garlic to the pan; sauté 2 minutes. Add the wine and stir, scraping up brown bits on the bottom of the pan. Add the tomatoes and cream, and let simmer for 8 minutes. Add the spinach and stir to wilt. Add the pasta and toss. Season with salt if needed. We buy a brand of Italian sausage from Wegmans that's made with turkey rather than pork. I've never noticed a difference and no one I've serve it to can tell either. 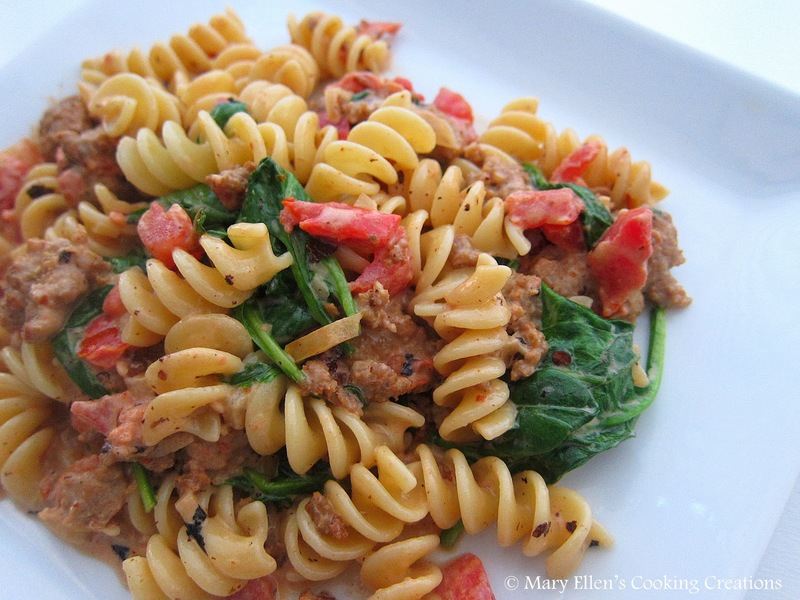 ;) Glad you liked this dish - it's a family favorite.